Our focus will be on federal income and payroll taxes as they are the most common. Fortunately, the State of Nevada does not have an income tax on businesses or individuals, so no discussion is necessary. While there are unemployment taxes in Nevada and other states have various types of taxes, both are beyond the scope of this discussion but should not be ignored. A qualified tax expert in your area should be consulted regarding the state taxing requirements a business may be subject to outside of Nevada. There are many advantages and disadvantages to each type which can be found in the table below. Our focus will be on the tax ramifications of each. The selection of the proper business form is the single most important tax consideration a new business can make and should be selected prior to beginning operations. This is probably the most common form of small business ownership. It is owned by a single person who assumes all the risk and all the reward of the operations. The owner is not considered an employee of the company. The business itself does not pay taxes. Because the owner and the business are one in the same, however, the owner pays income tax if there is a profit, which is then included with any other income on their tax return at a rate determined by that total income. Individual tax rates are determined by the level of income after all deductions have been taken (also known as taxable income). Tax tables that show what an individual would pay based on their taxable income can be found here. If the sole-proprietorship has a loss, then that loss is deducted against any other income on the individual tax return, and the rates are then applied. The owner is also subject to self-employment tax on their personal tax return if the business has a profit (but not if there is a loss). Self-employment taxes are the sole-proprietorship’s way of paying payroll taxes for the owner since they are not an employee of the company. Payroll taxes will be discussed shortly below. The sole-proprietor must pay 15.3% of the self-employment income, which is basically the net profit of the business. The sole-proprietor is allowed to deduct one-half of these taxes (technically the business’s share) on their personal tax return. 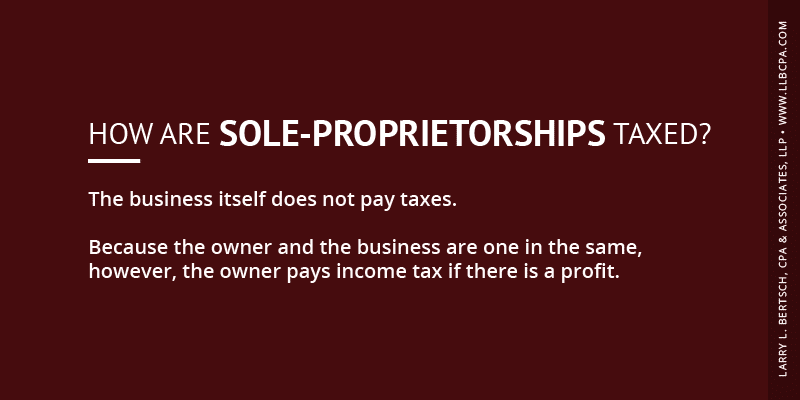 What Tax Form Does a Sole-Proprietorship File, and When Is It Due? The business itself does not file a tax return. Instead, the owner attaches a Schedule C, Profit or Loss From Business, to their individual Form 1040, which is filed on April 15th. A six-month extension to file is available. Please note that any extension is merely an extension of time to file the return and not an extension of time to pay. The sole-proprietor must pay careful attention to their estimated taxes, which are due for each year on April 15th, June 15th, September 15th and January 15th of the following year. These estimates must reflect both the income and self-employment taxes, as described above, resulting from a profit in the business throughout the year in addition to any other income and withholdings incurred outside the business that are reported on their individual tax return. Many sole-proprietors fail to plan for both of these taxes and are surprised by large tax bills and penalties when the tax return is filed. A competent professional such as a Certified Public Accountant or Enrolled Agent can help the sole-proprietor plan for these payments on a proactive basis. Since the owner is not an employee, they take a draw against capital and profits instead of a salary and are not subject to payroll taxes. They will be responsible for self-employment taxes on their individual tax return, as described above. Payroll taxes can be a significant cost of doing business with potential ramifications on cash flow and should not be ignored by any business. This form is very common with small business. This is an agreement by two or more persons to conduct a trade or business. There can be an unlimited number of partners. While not required, an Operating Agreement should be in place detailing the responsibilities and ownership percentages (which may or may not be equal) of the partners. The Partnership does not pay taxes. Rather the profit or loss of the Partnership each year “passes through” to the individual partners in shares (not necessarily equally) as determined by them. The partners then pay taxes on their personal returns, taking into account this passed-through profit or loss. The partners are also subject to self-employment taxes on their personal tax returns. This is the same way a Sole-Proprietor is taxed as mentioned above, and the tax rates are the same. 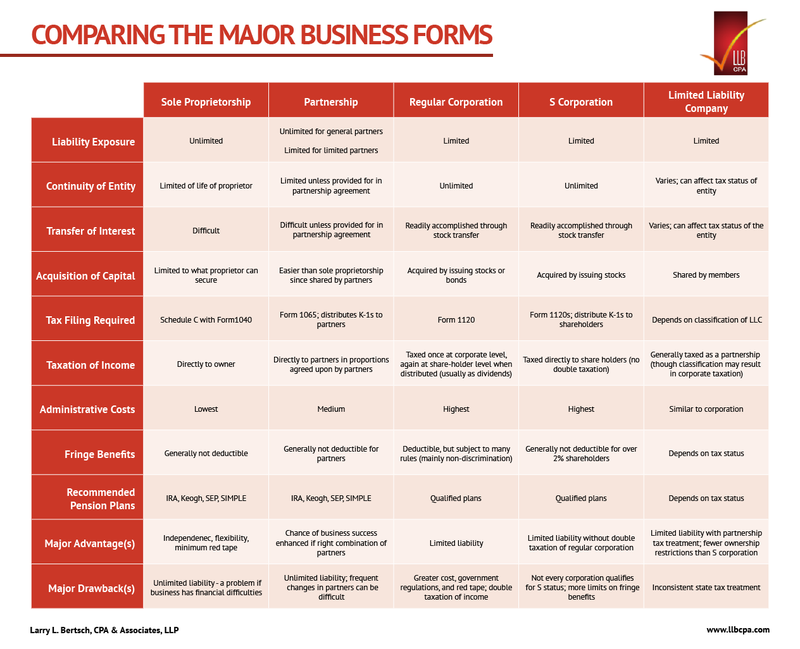 What Tax Form Does a Partnership File, and When Is It Due? The Partnership files a federal Form 1065, and it is due by the 15th day of the third month after the partnership’s year end. This is typically March 15 of the following year for a tax year ending on December 31. A six-month extension is available. Please note that any extension is merely an extension of time to file the return and not an extension of time to pay. Form 1065 is an information return. It provides information to each partner regarding their share of the income and deductions incurred by the Partnership. Each partner receives a Schedule K-1 detailing their specific share of these items. 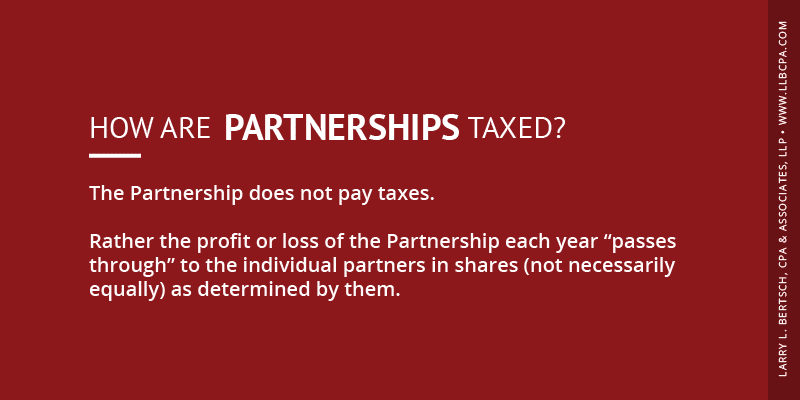 As the Partnership does not pay taxes, it is not required to make estimated payments. However, since profit and loss passes through to the partners and they are subject to taxes on those amounts as well as self-employment taxes, they may have to make individual estimated tax payments relating to their personal tax returns. This is the same as Sole-Proprietors described above. Partners generally receive guaranteed payments or distributions which are not considered payroll and thus not subject to payroll taxes, even if they perform services normally associated with being an employee. They will be subject to self-employment taxes on their individual tax returns. The Partnership is responsible for payroll taxes on the salaries, wages, and other compensation of all non-partner employees in the same manner described above for Sole Proprietors. One rarely sees a small business structured as a C Corporation. Typically, this is the form very large businesses take, and there are many shareholders who own a part of the business. Think Microsoft or Ford. It is a person or persons incorporated by charter from the Secretary of State of the state in which it resides. 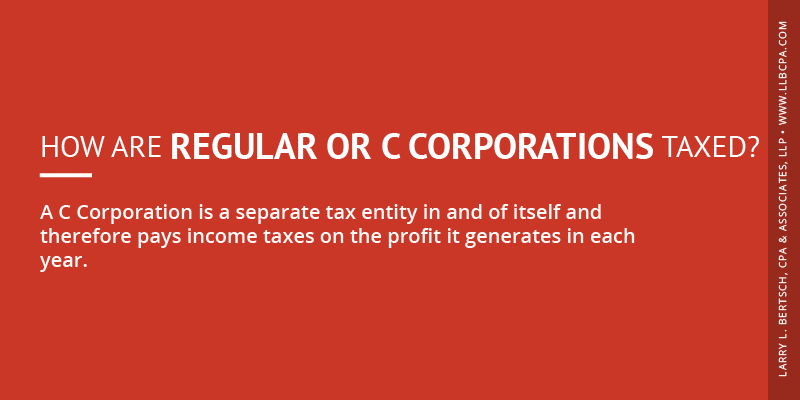 A C Corporation is a separate tax entity in and of itself and therefore pays income taxes on the profit it generates in each year. If there is a loss, the corporation will generally carryback or carryforward that loss to a year when there is a profit and offset the loss against the profit in that year. One tax disadvantage of a C Corporation is the treatment of dividends paid to shareholders. These dividends are paid to shareholders from profits after the corporation has paid its taxes and are also taxable to the shareholders resulting in what is called “double taxation”. The corporate tax rates can be found here. What Tax Form Does a C Corporation File, and When Is It Due? The C Corporation files an IRS Form 1120 and it is due by the 15th day of the fourth month after the corporation’s year end. This is typically April 15 of the following year for a tax year ending on December 31. A six-month extension is available. Please note that any extension is merely an extension of time to file the return and not an extension of time to pay. The IRS requires that taxes be paid on a pay-as-you-go basis instead of all at once at the end of the year when the tax return is filed. A C Corporation fulfills this requirement by making estimated tax payments on April 15th, June 15th, September 15th and December 15th. Any balance due must be paid when the return is filed. If enough taxes are not paid in by these dates or no estimates are made at all, the corporation can be subject to penalties for underpaying tax. Any employee of a C Corporation, whether they are a shareholder or not, that receives salaries, wages, or other compensation is subject to federal and state (if applicable) payroll taxes. It is the corporation’s responsibility to withhold these taxes, match any that are required by law, and remit these amounts to the appropriate taxing agency on a specified timely basis. Payroll taxes can be a significant cost of doing business with potential ramifications on cash flow and should not be ignored by any business. The S Corporation is a special type of corporation that combines the form (with some limitations) of a C Corporation and the tax treatment of a partnership. It is an entity defined by the Internal Revenue Code specifically for tax purposes. A business must elect to be treated and taxed as an S Corporation (using Form 2553), and there are specific rules that apply to ensure this designation. A competent professional such as a Certified Public Accountant or Enrolled Agent should be consulted before setting up this type of entity. 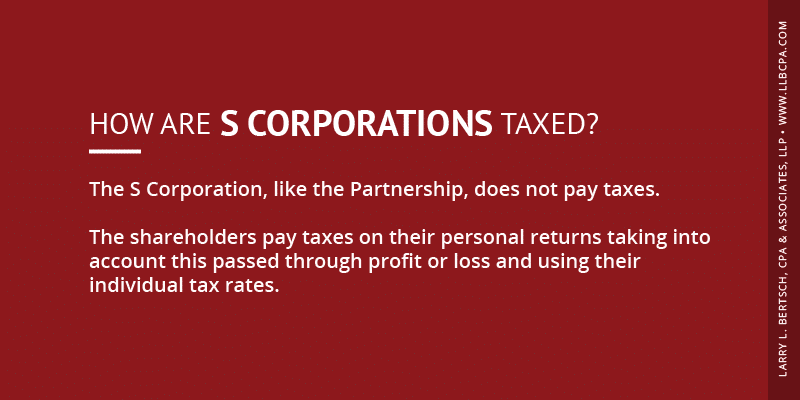 The S Corporation, like the Partnership, does not pay taxes. 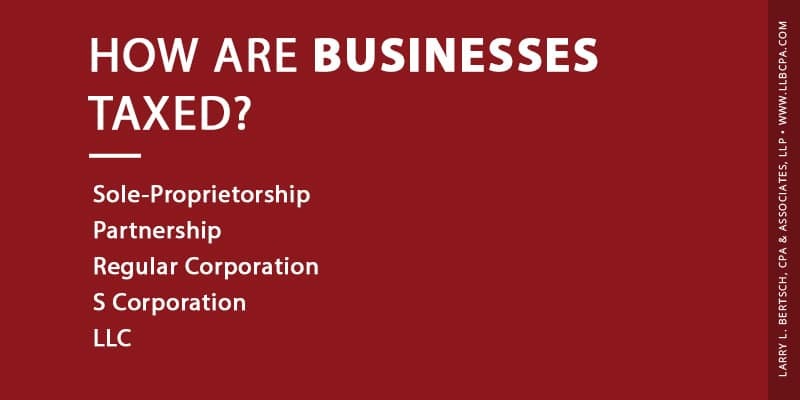 The profit or loss of the S Corporation each year “passes through” to the individual shareholders as determined by their percentage ownership of the shares issued by the S Corporation. The shareholders then pay taxes on their personal returns taking into account this passed through profit or loss and using their individual tax rates. The shareholders are not subject to self-employment taxes on their personal tax returns and this can be an advantage over a Sole-Proprietorship or Partnership, all other things being equal. Likewise, S Corporations do not give rise to “double-taxation” like C Corporations (as described above) because they pay out non-taxable distributions instead of taxable dividends. The tax consequences surrounding an S Corporation, again, are best discussed with a tax professional. What Tax Form Does an S Corporation File, and When Is It Due? The S Corporation files a federal Form 1120S, and it is due by the 15th day of the third month after the corporation’s year end. This is typically March 15 of the following year for a tax year ending on December 31. A six-month extension is available. Please note that any extension is merely an extension of time to file the return and not an extension of time to pay. Form 1120S is an information return. It provides information to each shareholder regarding their share of the income and deductions incurred by the corporation. Each shareholder receives a Schedule K-1 detailing their specific share of these items. As the S Corporation does not pay taxes, it is not required to make estimated payments. However, since profit and loss flows through to the shareholders, and they are subject to taxes on those amounts, they may have to make individual estimated tax payments relating to their personal tax returns just like a Sole-Proprietor or Partner as described above (with the exception of self-employment taxes). Shareholders generally receive distributions which are not considered payroll, and thus not subject to payroll taxes. Any shareholder involved in day-to-day operations is required to be paid a reasonable wage or salary and the S Corporation is responsible for payroll taxes on those amounts. Shareholders are not subject to self-employment taxes on their individual tax returns. The S Corporation is responsible for payroll taxes on the salaries, wages and other compensation of all non-partner employees in the same manner described above for other entities. Payroll taxes can be a significant cost of doing business with potential ramifications on cash flow and should not be ignored by any business. The LLC combines the liability protection of a C Corporation with the tax treatment of any of the entities described above and is generally easier to set up than a corporation. It is formed under state law by filing articles of organization. It can have one member or unlimited members. One of the unique aspects of an LLC is the ability to choose its tax treatment. An LLC can elect to be taxed as a C Corporation using Form 8832. An LLC can elect to be taxed as an S Corporation using Form 8832 and Form 2553. 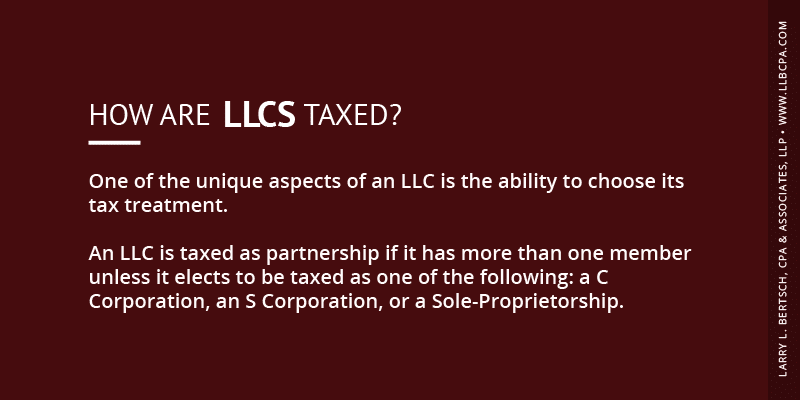 An LLC can choose to be taxed as a Sole-Proprietorship if there is only one member (known as a Single Member LLC or a disregarded entity not separate from its owner). No form is required. In general, once a tax designation is elected, it must remain in effect for five years before being changed without approval from the IRS. What Tax Form does an LLC File and when is it due? An LLC does not have its own tax form. It will file the tax return on the due date (including extension) associated with the election it has made as to how it will be taxed. If taxed as a Partnership – Form 1065. If taxed as a C Corporation – Form 1120. If taxed as an S Corporation – Form 1120S. If taxed as a Sole-Proprietor – Schedule C of Form 1040. Estimated taxes of an LLC are determined by the tax treatment it elects. Any employee of a LLC that receives salaries, wages, or other compensation is subject to federal and state (if applicable) payroll taxes. It is the LLC’s responsibility to withhold these taxes, match any that are required by law, and remit these amounts to the appropriate taxing agency on a specified timely basis. Payroll taxes can be a significant cost of doing business with potential ramifications on cash flow and should not be ignored by any business. From the discussion above, it should be apparent that the best form of business is the one that best suits the company’s purpose and should take into account all factors, not just taxes. That said, from a tax perspective, the most important consideration a new business can make is to decide how it wants to be taxed. This decision should be made with the help of a competent and qualified small business and tax consultant, such as a Certified Public Accountant or Enrolled Agent, who can guide the new business owner towards the proper solution. Once a decision on the form has been reached, a business attorney should be consulted to make sure the proper paperwork is in place to formalize the selection.